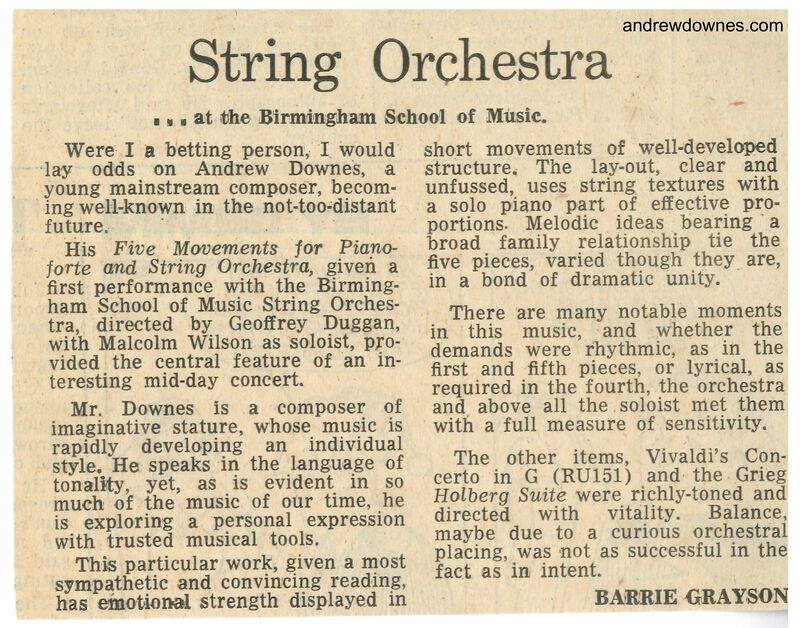 One of the first works which Andrew wrote after our marriage was his Five movements for Piano and String Orchestra, which he composed when we were living in our first home in Lynwood Drive, Blakedown, Worcestershire. I was bowled over by how original and beautiful this work was. 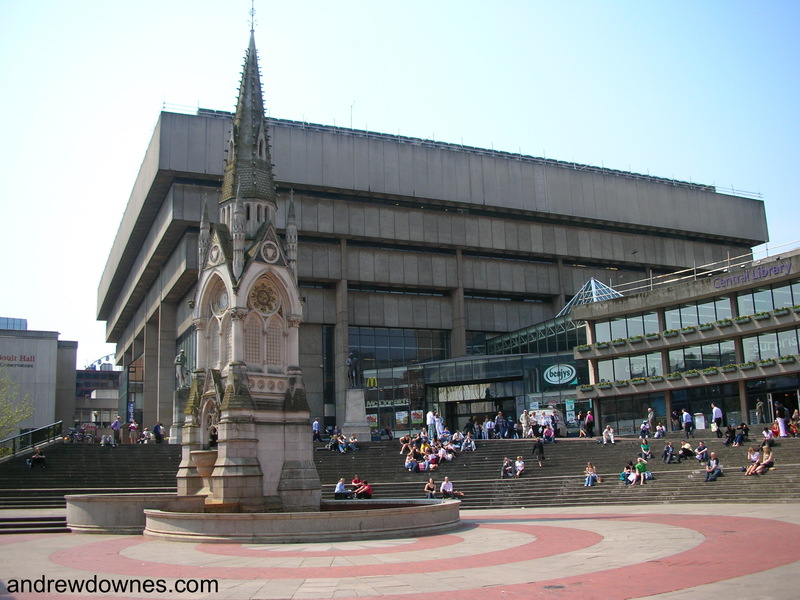 Andrew completed it in 1976. 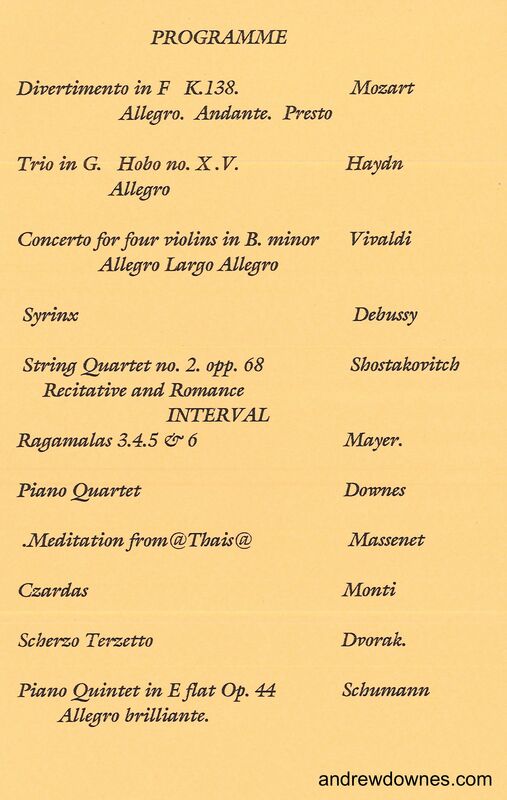 I have always loved these 5 Movements and am always elated each time they are played. 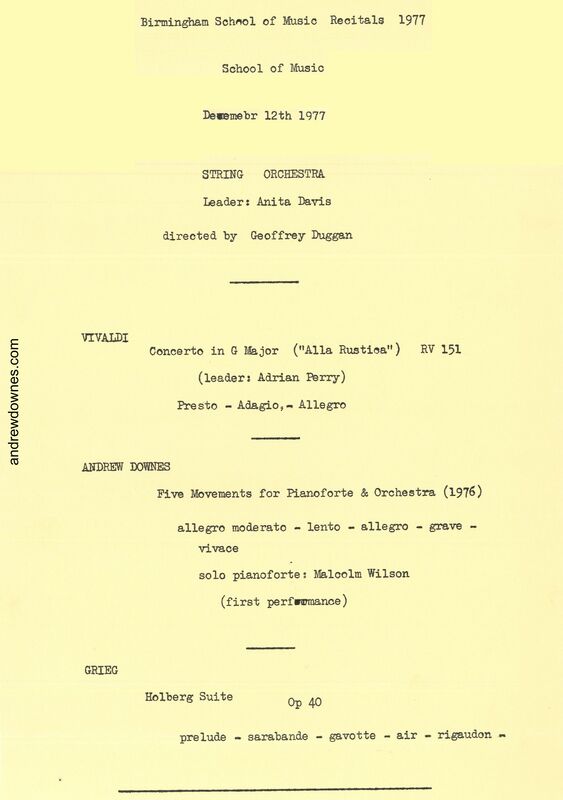 The work was premiered in the Recital Hall of the Birmingham School of Music (now Royal Birmingham Conservatoire) on December 12th 1977 by pianist Malcolm Wilson and the Birmingham School Of Music String Orchestra, conducted by Geoffrey Duggan. and the exciting double basses leading into the final canonic flourish at the end. 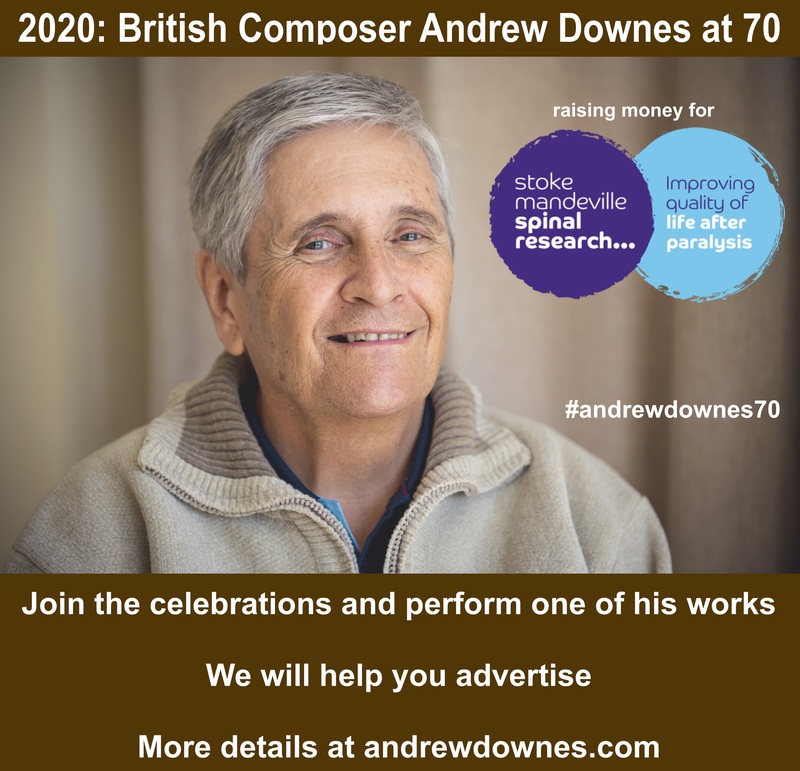 In 1991 Andrew was invited by the new Principal of Birmingham Conservatoire, Dr Kevin Thompson, to set up the new School of Creative Studies there. 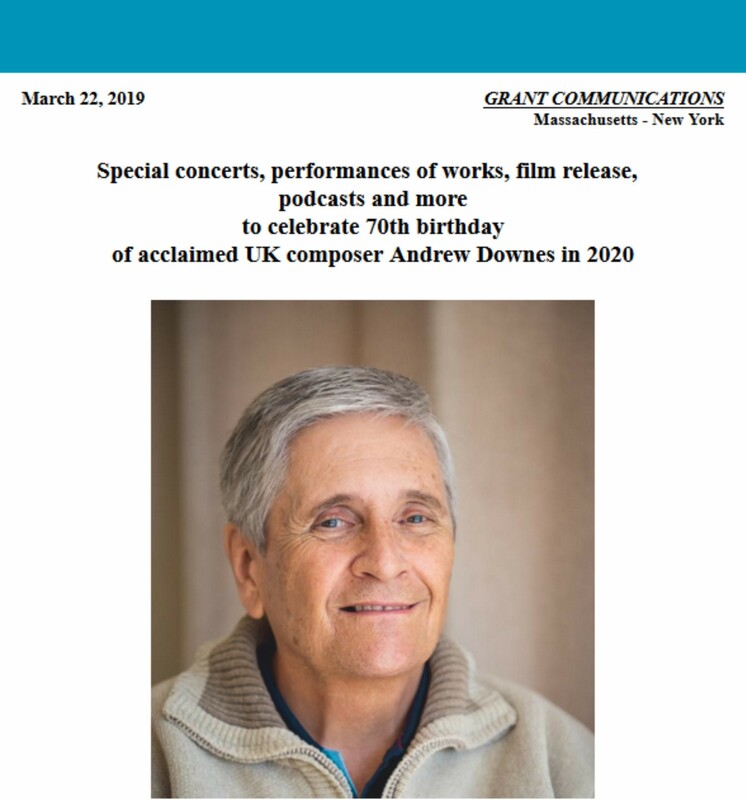 Kevin introduced Andrew to Indian born composer, John Mayer, whom he suggested could be appointed as Composer-in-Residence in the new School. 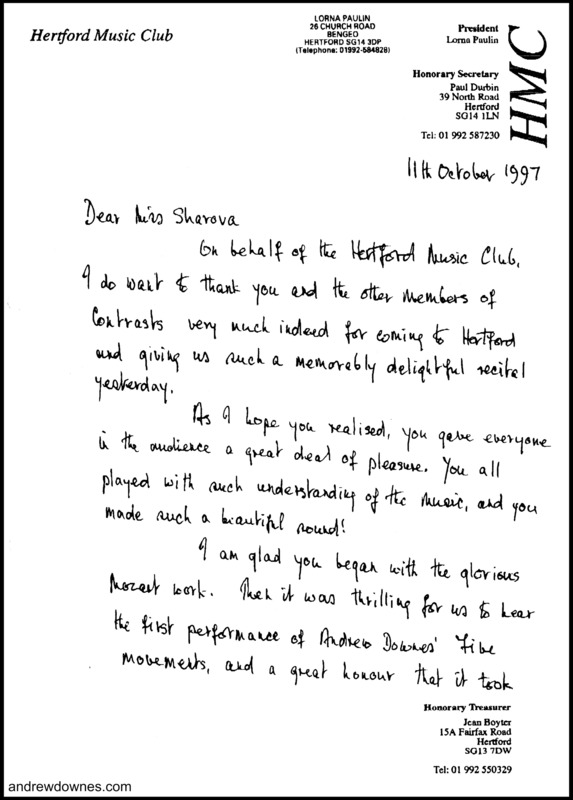 Andrew was immediately taken with John's immense knowledge and enthusiasm, and the 2 worked well together. 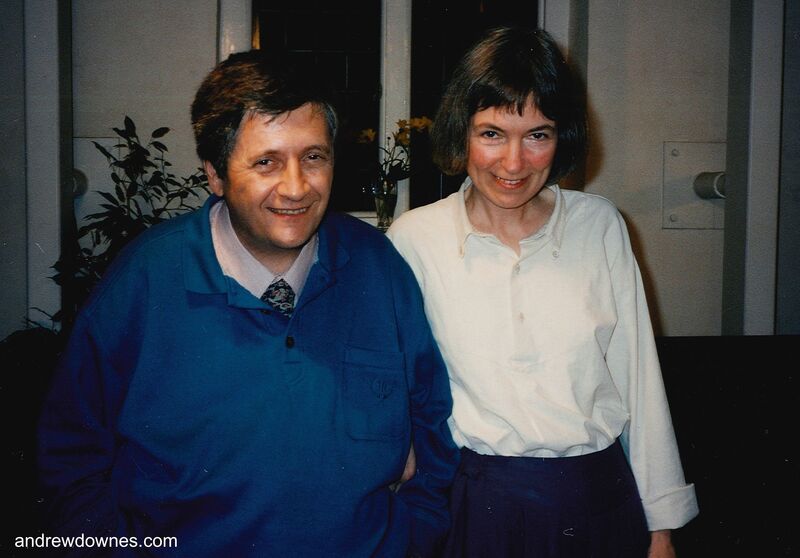 John (who was also a violinist/violist), with his British born wife, pianist Gillian Mayer, gave the Indian premiere of Andrew's Sonata for Violin and Piano at the Calcutta School of Music in 1994. 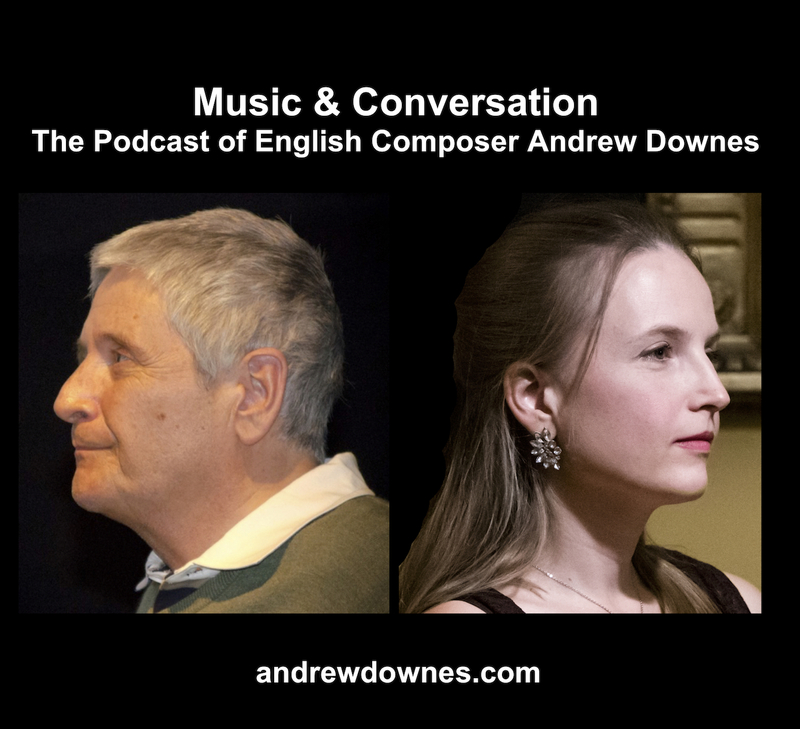 John and Gillian also introduced Andrew to violinist, Alla Sharova, who also performed the Violin Sonata and a new work, The God Marduk, written especially for her by Andrew. 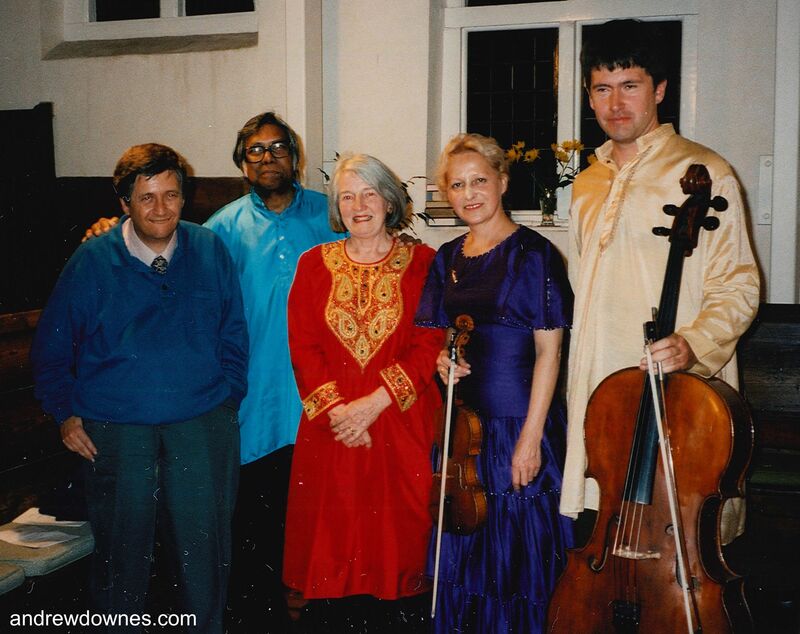 John, Gillian and Alla formed a piano quartet with cellist, Thomas Gardner. 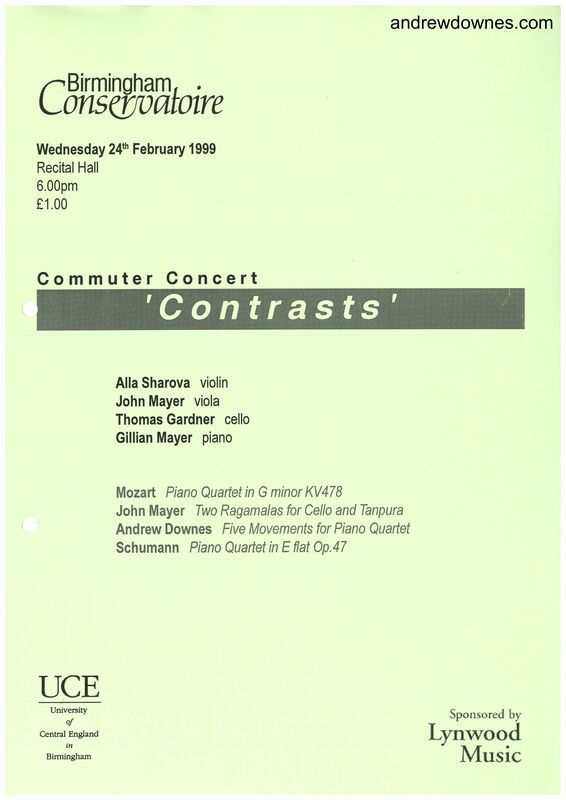 They called themselves 'Contrasts', and asked Andrew for a work. 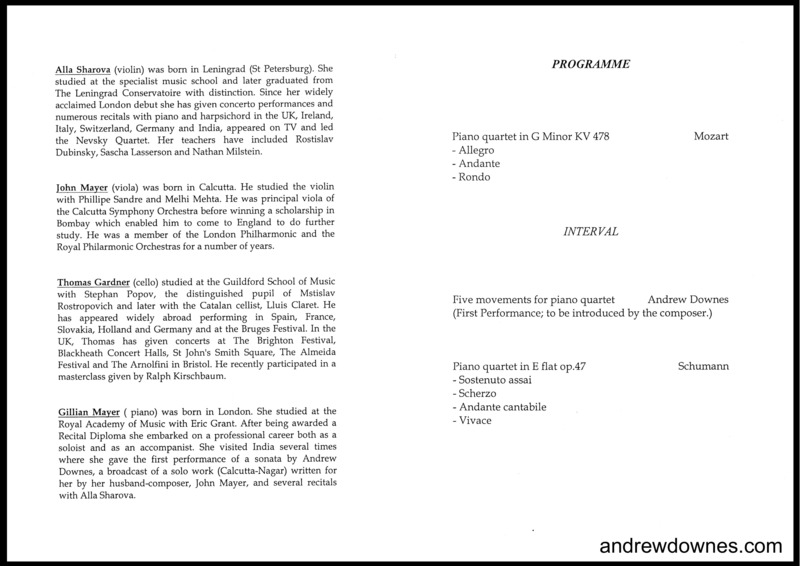 Andrew was busy fulfilling a number of commissions, so I offered to arrange the Five Movements: for Piano Quartet. 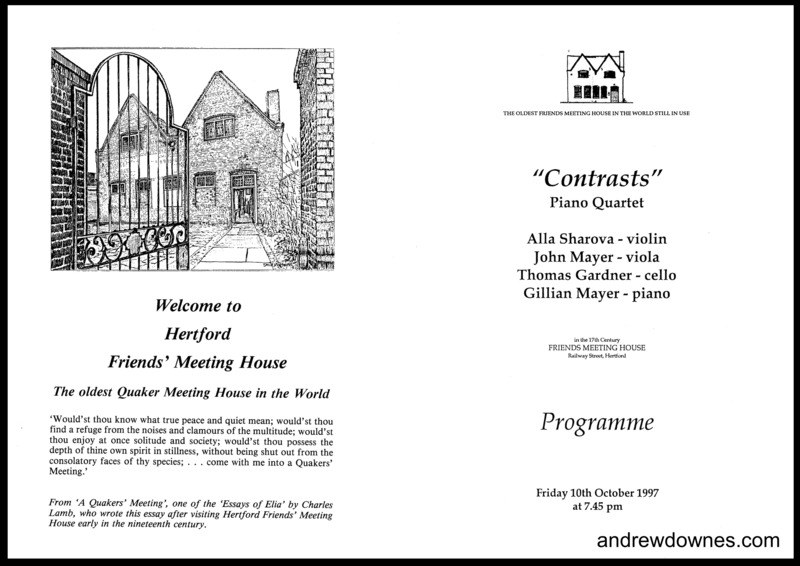 Contrasts were very pleased with the work, and first performed my arrangement at the Friends' Meeting House in Hertford, on October 10th 1997. Alla was keen for me to take a bow after the performance for my arrangement, despite my reluctance (This was Andrew 's composition, not mine!). Alla came into the audience to haul me up! 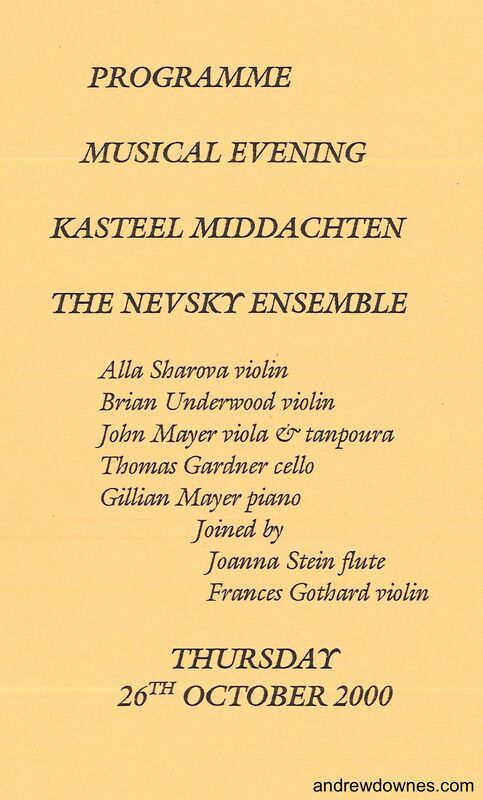 and then, under their new name, 'The Nevsky Ensemble', at Middachten Castle in Holland and in Luxembourg (October 2000). 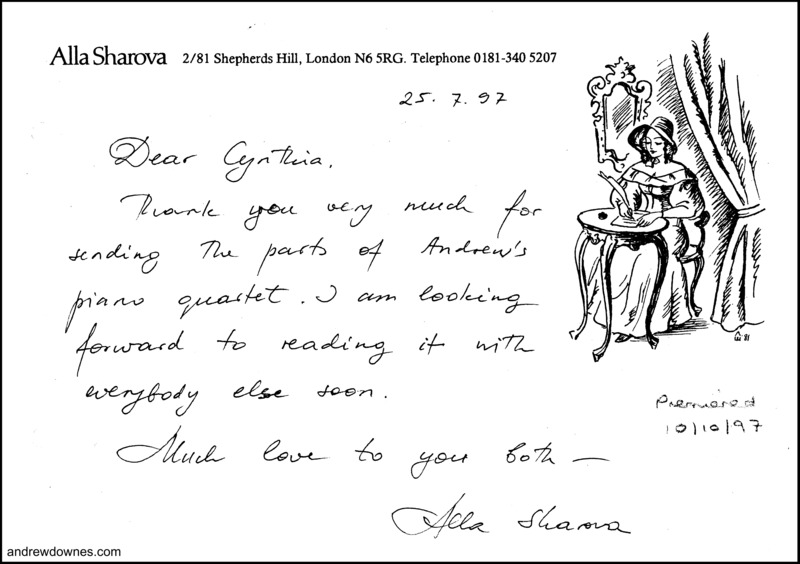 Although our daughters, Anna and Paula, were not even born when Andrew wrote his Five Movements for Piano and Strings, they have been involved in a number of performances of the work. 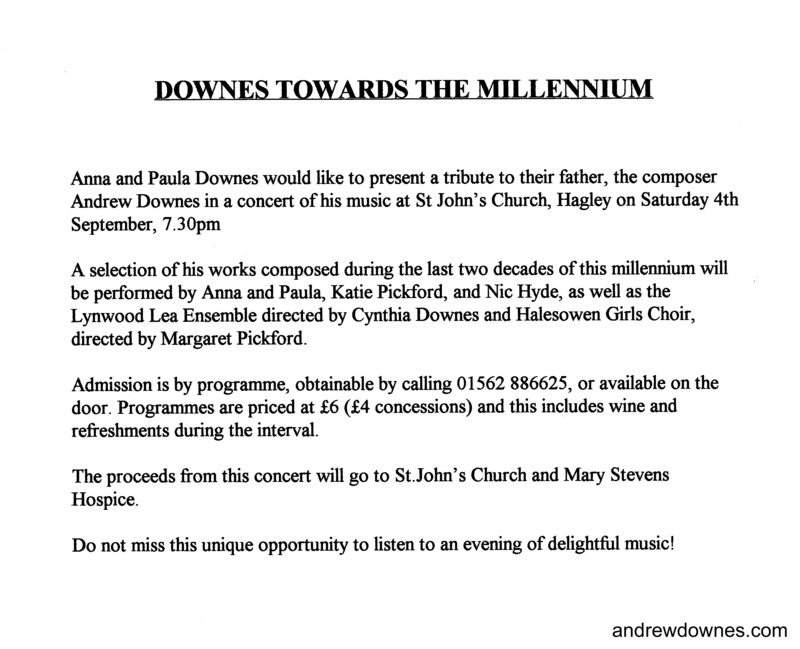 In 1999 Anna organised a concert of Andrew's music in St John's Church, Hagley, Worcestershire, to raise funds for Mary Stevens Hospice. 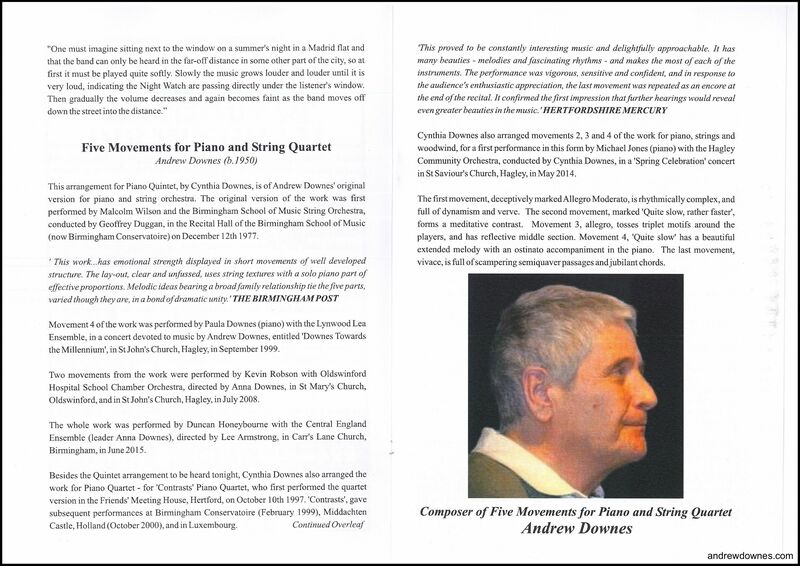 Movement 4 of Andrew's Piano & Strings work was chosen for the concert and performed by our daughter, Paula (piano), with the Lynwood Lea Ensemble, directed by me. 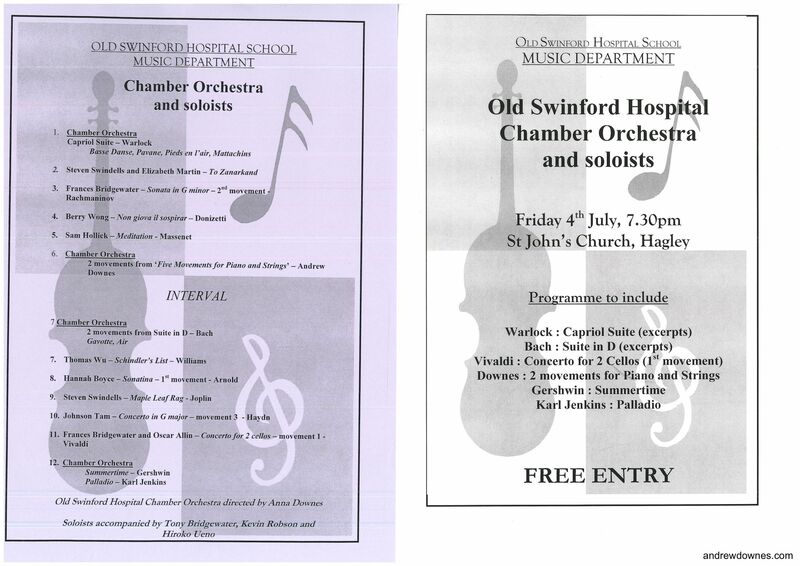 In July 2008, Anna directed 2 Movements from the work, with pianist Kevin Robson and Oldswinford Hospital School Chamber Orchestra, in St Mary's Church, Oldswinford, and in St John's Church, Hagley. 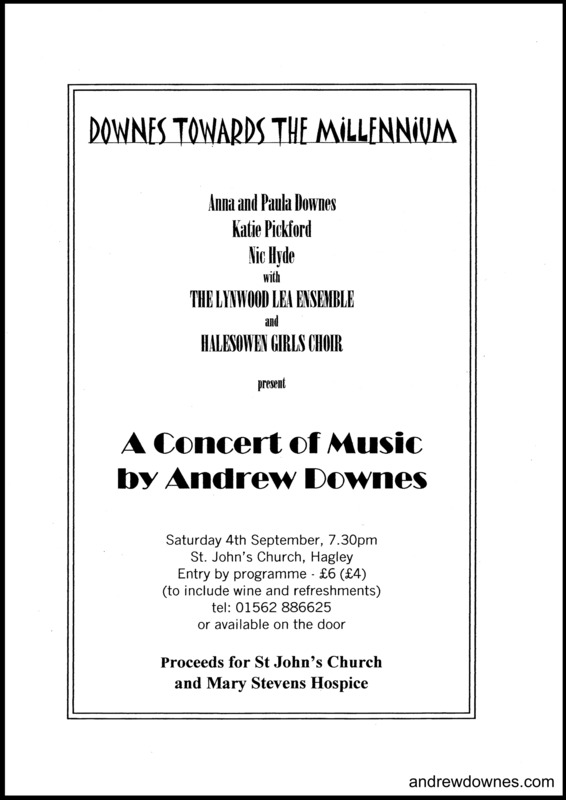 In May 2014, I arranged Movements 2,3 and 4 for Michael Jones (piano) with my Hagley Community Orchestra, led by Anna, which I conducted, in a 'Spring Celebration' concert in St Saviour's Church, Hagley. 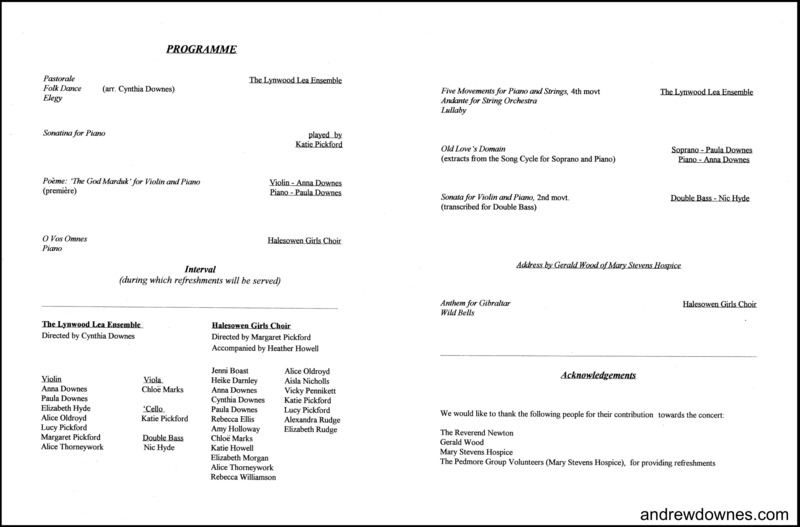 The Central England Ensemble (founded and led by Anna) performed the whole work with pianist Duncan Honeybourne, directed in this performance by Lee Armstrong, in Carr's Lane Church, Birmingham, in June 2015. I played viola in the concert and loved reliving the work. 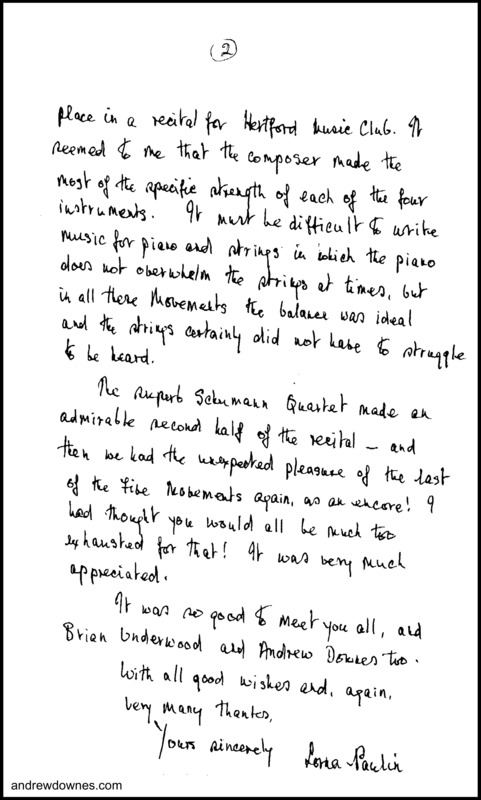 Two years after this I arranged the Five Movements for the Amabile Piano Quintet, set up by Anna. She led the group with Dan Neville (violins 1 & 2), Victoria Backhouse (viola), Joanne Jefferis (cello) and Marcel Zidani (piano). 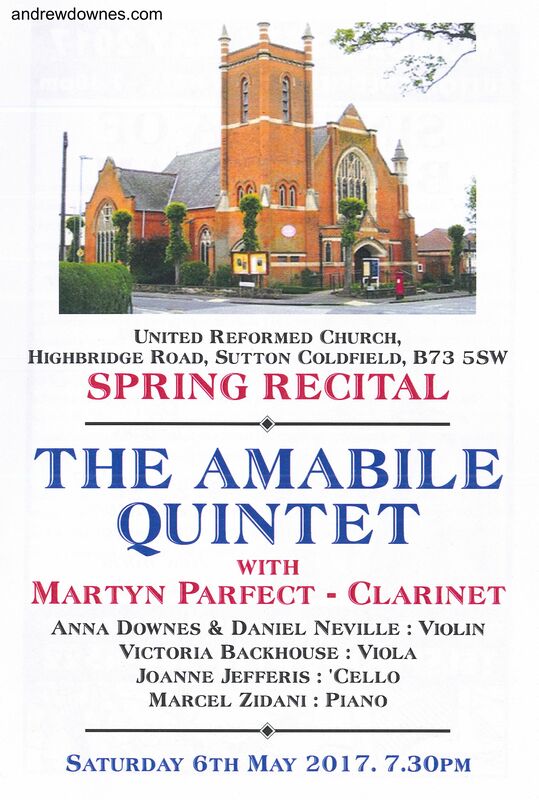 They premiered the Five Movements for Piano Quintet at the United Reformed Church, Wylde Green, Sutton Coldfield, on May 6th 2017. 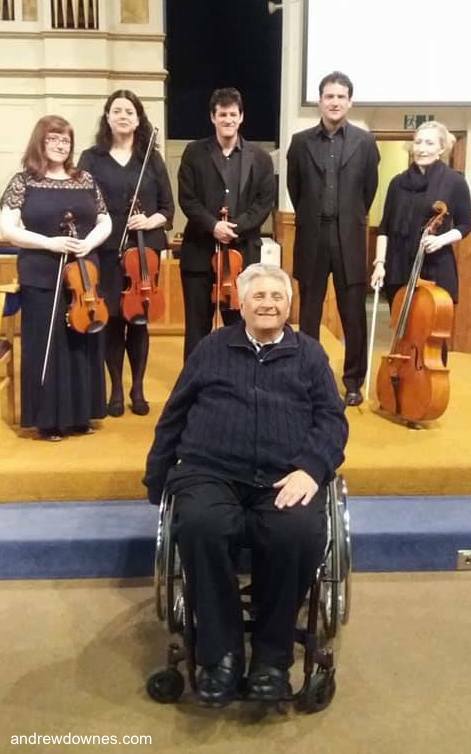 Following the performance of his Piano Quintet, Andrew Downes in front of Amabile quintet: Anna Downes, Dan Neville, Vicky Backhouse, Joanne Jefferis, Marcel Zidani, in the United Reformed Church, Wylde Green, April 2017. Have you performed in this work or come to watch?